After just a few short hours of rain, dozens of Palestinian shopkeepers have spent the past week salvaging the goods of their stores, and exhausting the modest means of their bank accounts to return places of business into working order. To a simple passer-by, the flooding would have looked like the rare product of circumstances: the Old City being located at the geographical low spot of Hebron and poor infrastructure. But that isn’t the whole story. Israel’s military occupation of Hebron sometimes manifests itself in subtle ways. Unless you specifically look at how the instruments of apartheid impact the lives of Israelis and Palestinians differently, the systems of oppression can go unrecognized. It’s easy to take a short stroll as a visitor through the H2 area of Hebron, navigating your way through the matrix of Israeli military checkpoints, and see young men and women with their children standing in the hot sun being interrogated by the Israeli Border Police – having to convince them that a trip to the store for milk and diapers doesn’t pose an existential threat to the Jewish community. Bearing witness to masked Israeli soldiers taking siege of Palestinian homes in the Old City, forcing families into rooms and sealing them off so Israeli snipers can take position on their roofs, is a common-place occurrence that internationals routinely witness. Armed Jewish settlers walking down streets where Palestinians are forbidden to be – despite having homes there – paints a clear picture of apartheid. There are over 100 road blocks, check points, and alleyways barricaded off that restrict and control the movement of Palestinians in Hebron. This military apparatus was specifically engineered to create a matrix of control around the Ibrahimi mosque, linking all of the Jewish settlements from Tel Rumeida to the northwest to the main settlement of Kiryat Arba to the south east – all built and maintained under the political buzzword of “Israeli security”. But this isn’t simply about security; it’s about creating a completely unsustainable living situation for Palestinians living in the low valleys of the Old City of Hebron. There is a small corridor that separates the Jewish settlement of Avraham Avinu from the Palestinian community in the Old City. 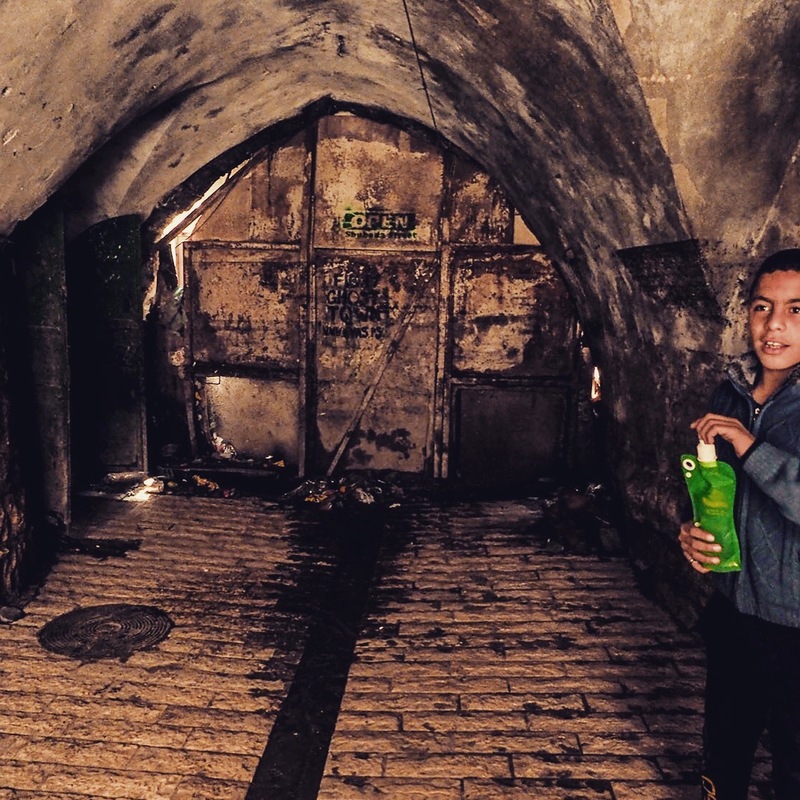 This historical corridor didn’t just serve as a passageway to link up the different neighborhoods of Hebron—it also served as a strategic point of drainage during the rainy season. It’s not only that the passageway was blocked, it was the way in which it was blocked. If the aim for sealing off the corridor was to prevent people from passing, a simple gate would have worked. But instead, an iron clad door, which restricts the passage of water, was installed – preventing the water from flowing freely out into the streets and into the main drainage points. This iron clad door is completely unnecessary from a security framework. The result: Palestinians being forced to rehabilitate their shops every time a substantial rainstorm hits Hebron for a few hours. Tahor Mosbah Sa’id Ahmed who owns a radio and video shop had to throw away hundreds of shekels of inventory because of the flooding. After several days of cleaning his shop, he is still not done. Ismail Shweki, who has run his grocery store for decades, had to pay out 500 shekels in cleaning expenses to get his store ready. The iron door is symbolic of Israel’s military occupation: an iron door tucked away in the shadows, unknown by most of the world, and damaging the lives and livelihoods of Palestinians. The iron gate to the Avraham Avinu settlement which was blocked off with an iron gate during the second intifada. Since then, rubbish and other materials have been shoved in the cracks to stop the drainage of water in the Old City of Hebron, causing the market to flood and cause substantial economic damage to the neighborhood.